As per the Goldstein Research analyst, the global flexible packaging market size valued USD 91 billion in 2016 and is anticipated to grow at a CAGR of 5.12% during the period 2016-2024. 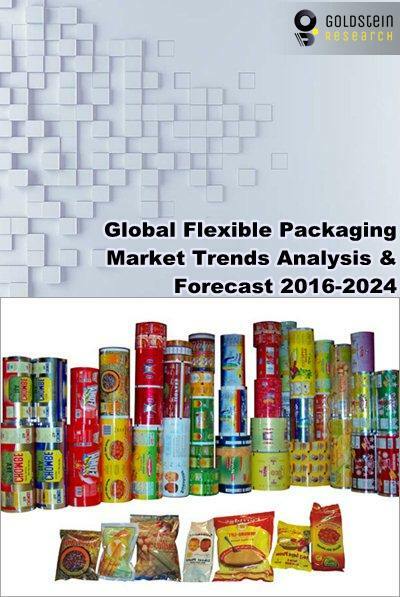 The report covers the present ground scenario and the future growth prospects of the flexible packaging market for 2016-2024 along total volume of flexible packaging production in every region. We also provide the data related with the raw material availability for flexible packaging in major countries. We calculated the market size and revenue share on the basis of revenue generated from flexible packaging companies across the globe. Our report also provides the data related with packaging waste generated and regulations over reduction of packaging waste in major countries. On the basis of material type, plastic films accounted for 60% share of total flexible packaging in 2016 whereas, paper segment held nearly 19% market share in the same year. Rising environmental concerns is likely to boost the growth of flexible paper packaging market during the forecast period. Flexible packaging market Outlook 2016-2024, has been prepared based on an in-depth market analysis from industry experts. The report covers the competitive landscape and current position of major players in the global flexible packaging market. The report also includes porter’s five force model, SWOT analysis, company profiling, business strategies of market players and their business models. Global flexible packaging market report also recognizes value chain analysis to understand the cost differentiation to provide competitive advantage to the existing and new entry players. Our global flexible packaging market report comprises of the following companies as the key players in the Flexible Packaging market: Amcor Limited, DuPont, Mondi Plc, Smurfit Kappa Group plc, AEP Industries, American Packaging, Automated Packaging Systems and Bemis Company. Other high-flying vendors in the market are: Berry Plastics, Coveris Holdings, Innovia Films, MeadWestvaco, Printpack, Rexam, Sealed Air Corporation, Sonoco Products, Wipak, Constantia Flexibles Group GmbH, Huhtamäki Oyj, Clondalkin Group Holdings BV, Ukrplastic, Ampac Holdings, Ball Corporation, Exopack, Tetrapak, International Paper Company, Anchor Packaging, CL&D Graphics, Cellpack and Britton Group. According to the report, longer product shelf life with flexible packaging is one of the major drivers fuelling the flexible packaging market growth. Over 70% of population of the U.S. purchases food with flexible packaging due to its extended shelf life. Further, the report states that stringent government regulations associated with the recycling of packaging waste materials is a major hindering factor for the growth of flexible packaging market. Based on geography, Asia-Pacific is the dominating region with 41% of global flexible packaging market followed by Europe and North America. Whereas, Middle East and Africa flexible packaging market is expanding at a faster rate and is expected to grow at a CAGR of 8.0% during the forecast period. On the other hand, Latin America region shows huge opportunities for flexible packaging market, owing to the booming retail and food & beverage industries in the region. What is the estimated total market size by 2024 and what would be the expected growth rate of flexible packaging market? What are the total exports & imports data of flexible packaging in every region and what would be the opportunities over the forecast period? How much packaging waste generated in major countries and what the government regulations for reduction of packaging waste in those countries? How flexible packaging is helping in reducing packaging waste and what will be the future prospects of this market? Who are the leading manufacturers of flexible packaging machinery and what would be the growth opportunities over the forecast period?